The Rams are seeking their third consecutive Class AA state title. 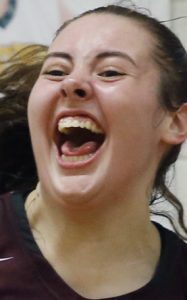 How they got here: Gorham, seeded fifth in the South, defeated Maine Girls’ Academy (63-37), South Portland (53-42) and Scarborough (47-28) in the regional tournament; Edward Little, seeded third in the North, defeated Lewiston (49-48), Portland (58-38) and Oxford Hills (48-45). Key players: Gorham – Mackenzie Holmes, jr., C (21.0 points per game, 13.2 rebounds, 2.9 steals, 5.2 blocks), Michelle Rowe, sr., F (7.0 points, 4.9 rebounds, 2.2 assists), Adele Nadeau, fr., G (9.0 points, 3.7 rebounds, 2.5 assists), Olivia Michaud, fr., G (2.4 points, 1.8 assists), Brittany Desjardin, jr., G (4.3 points, 2.4 assists, 2.0 steals); Edward Little – Hannah Chaput, so., G (10.2 points, 1.6 steals), Grace Fontaine, jr., G (9.8 points, 2.6 steals), Jade Perry, jr., F (8.7 points, 5.4 rebounds, 3.4 assists, 2.2 steals), Piper Norcross, sr., G (4.4 points, 3.7 rebounds, 3.8 assists, 2.0 steals), Chantel Ouellette, so., G (8.0 points, 3.7 rebounds). What Gorham has to do to win: The Rams, who have won the last two Class AA titles, come in on a roll. They have one of the best players in the state in Holmes, who is a force on both offense and defense, but have had huge contributions from just about everyone in their playoff run. The Rams are going to have to continue to hit their outside shots to keep the Eddies from collapsing on Holmes. If they can do that, that opens up scoring lanes for Holmes. Defensively, Gorham has won by pressuring outside shooters. Holmes is going to alter everything inside, so the Rams want to take away EL’s perimeter game. What Edward Little has to do to win: The Eddies, who have never won a basketball state championship, need to continue to get a balanced offense. They’ve done that in every playoff game. Perry has been particularly effective on the perimeter, hitting four 3-pointers in the regional final, and could present a matchup problem for Gorham. The Eddies would like to pressure the Rams’ young guards all over the court. EL’s first-year coach, Chris Cifelli said, most importantly, “we better not have Holmes go through the roof again.” They need to keep her scoring down to have a chance.